The HMP155A, manufactured by Vaisala, monitors relative humidity (RH) for the range of 0 to 100% RH and temperature for the range of -80° to +60°C. It can provide reliable measurements for a wide range of applications, as part of a weather station system or as a single instrument. All Campbell Scientific dataloggers are compatible. 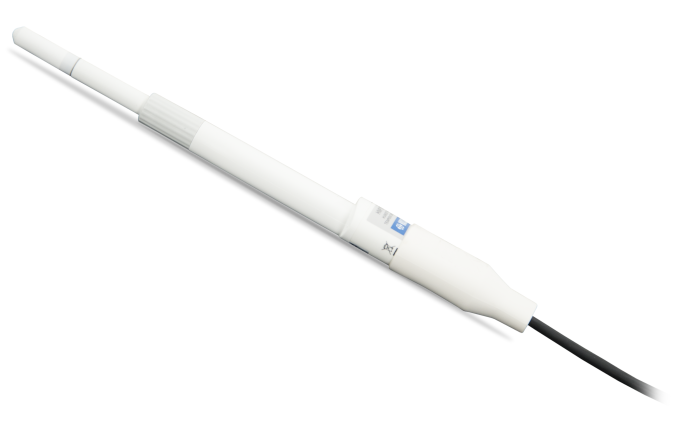 The HMP155A uses a HUMICAP180R capacitive thin film polymer sensor to measure RH, and a PRT to measure temperature. To reduce the current drain, power can be supplied to the HMP155A only during measurement when the sensor is connected to the datalogger’s switched 12 V terminal. Dataloggers that do not have a switched 12 V terminal, such as the CR510 or CR7, can use the SW12V switched 12 V device to switch power to the sensor only during measurement. The response time for the RH specification is for the HUMICAP 180R at 20°C in still air with sintered PTFE filter and a 0 to 75% RH step change. The factory calibration uncertainty is defined as ±2 standard deviation limits. Uncertainty is at +20°C. Small variations are possible; see also the calibration certificate. -NOTE- Accuracy specifications include non-linearity, hysteresis, and repeatability. Entire Temperature Range Refer to graph in probe manual. and low wind speeds (< 2 m s-1 [~4.5 mph]), giving a better measurement. Can the 41303-5A 6-plate radiation shield or the 41003-5 10-plate radiation shield be used with the HMP155A-L? No. The HMP155A-L requires the 41005-5 14-Plate Solar Radiation Shield. Single-ended channels are typically used when it is desirable to use fewer channels and the cable length is shorter—less than 6.1 m (20 ft). Differential channels are preferable when the cable needs to be longer than 6.1 m (20 ft).